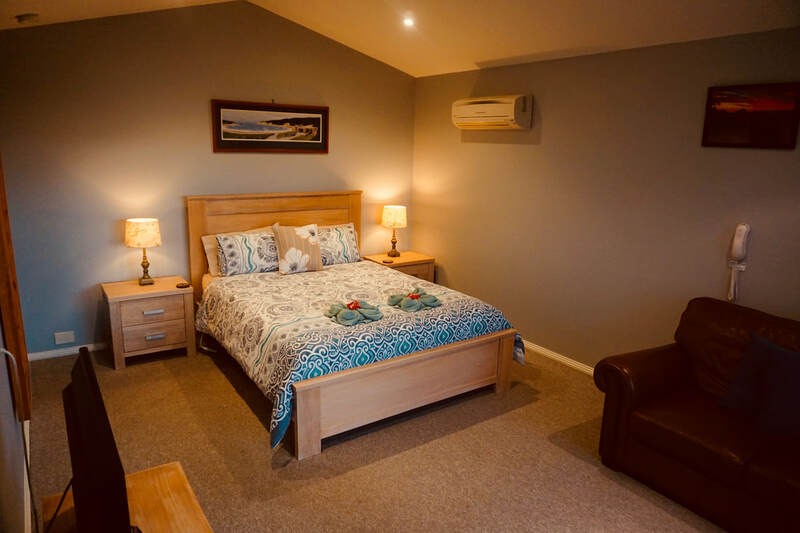 The Coastal suite is perfect for the weary traveller and visitor to the Great Ocean Road, Otways, Twelve Apostles or Great Ocean Walk. A comfortable and luxurious room ensures your stay is memorable and enjoyable. Then there's the views- the sunsets, coastal and valley views, and sandstone cliff faces of the Twelve Apostles will be sure to delight and leave a lifelong memory. 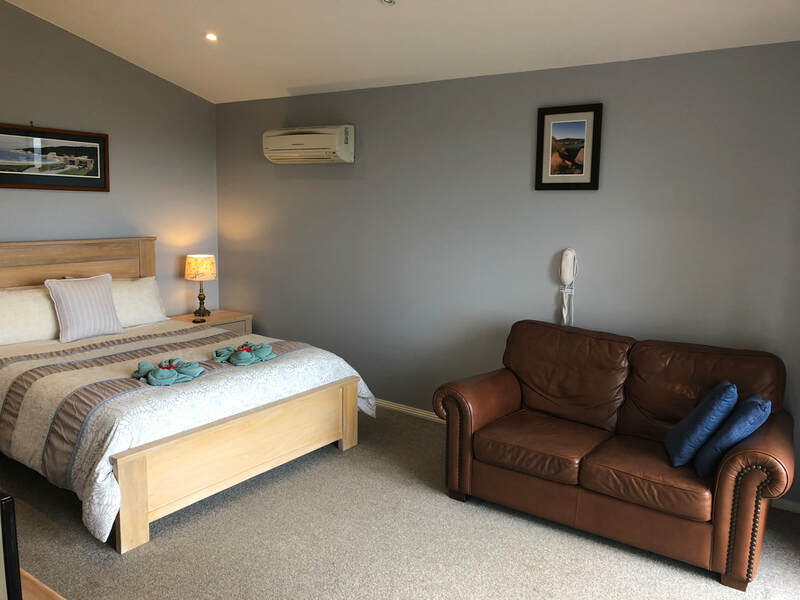 For your comfort we have provided ample bedding, electric blankets, reverse cycle heating/cooling and all the mod cons needed to ensure a fantastic stay. 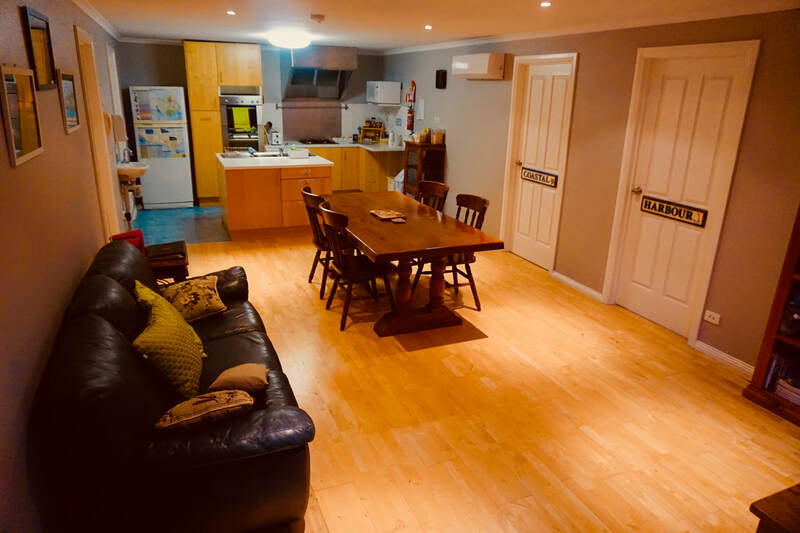 The shared kitchen/lounge (as seen at bottom) is a fantastic opportunity to cook an evening meal and don't forget a continental breaky and tea/coffee is provided free with the room. No wonder theses rooms are so popular. If you're after an extended stay and more luxury please consider our cottages- they're amazing! A small corner spa soothes those muscles and is perfect to enjoy your romantic time away. And those views- coastal, bush and sunsets are amazing! Newly renovated and delightfully decorated- our Coastal Suite will impress with its comfort and beauty. Warm and cosy, it will surely impress! Spectacular valley and coastal views from your deck and room await you from our Coastal Suite. I've even had guests relax on a chair late at night and be captivated by the amazing star show away from the city. Subtle and earthy paint tones make the Coastal Suite a relaxing room while the comfortable and warm bedding ensures an invigorating night's sleep. With the suite and nature complementing each other- you'll love the tranquil vibe. 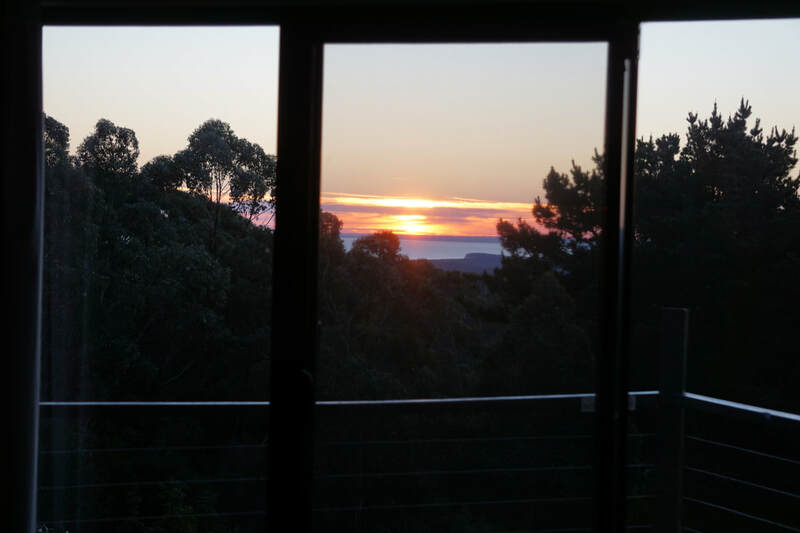 Our Coastal Sunsets are spectacular and showcase our landscaped gardens; featuring native bird attracting plants and local sandstone. Recycled grey-water helps the plants flourish. Our two suites are West Facing and the sunsets and views are memorable. The sandstone cliffs of the Twelve Apostles and bush scenery make spectacular backdrops from the two balconies. Beautifully appointed and luxurious- perfect for that one night or short stay, while visiting the GOR or Twelve Apostles. Coastal's queen size bed is very comfortable and appealing. Electric blankets, warm underlay and comfy pillows will ensure a good night's rest. A well appointed commercial kitchen and lounge is shared between the two suites. We ask our guests to ensure they respect the area and others. Room includes reverse cycle heating/cooling and books/games. A complimentary continental breaky is also provided. 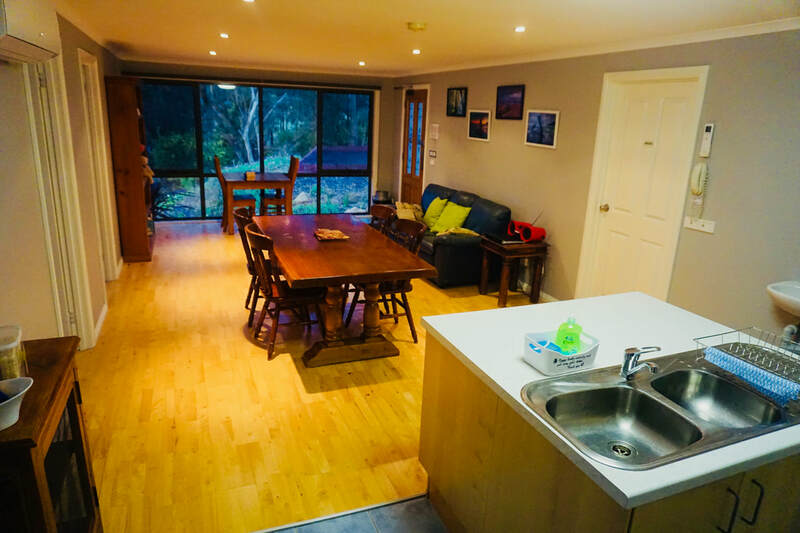 A terrific place to share as a family, with friends or on your own. 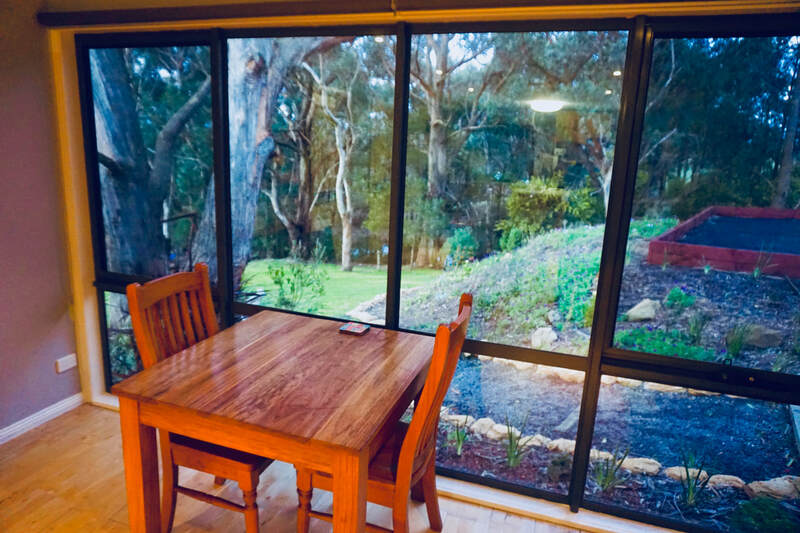 A peaceful and tranquil bush setting is viewed from the room. Kookaburras, kangaroos, gang gang cockatoos are just a few of our visitors. The commercial kitchen is great for cooking up a meal with all the utensils you need provided. A complimentary continental breaky completes your stay. The cosy kitchen and lounge includes a bookshelf with great reading and board games and will ensure your stay is enjoyable and complete. All it's missing is you!